By Guest Author Marlo Thomas, an Emmy, Golden Globe and Grammy winner and activist. Three in every four kids witness bullying, according to a PSA from the Ad Council and the MLB Network. If there’s one thing that youth sports teaches us, it’s teamwork — and not just among the kids on the field. Every day, parents and coaches and children across the country collaborate and communicate with each other at game time, whether they’re on the basketball court or baseball diamond. It’s that intimacy that makes youth athletics so special. So why not use this incredible connection to speak to our kids about something that’s become increasingly critical in their lives: the epidemic of bullying? When I created Free to Be…You and Me more than 40 years ago, I hoped to show kids that the world was full of possibilities. Today, as part of my work with the Free to Be Foundation, we’re continuing to spread that same message of freedom and empowerment by fighting to prevent bullying. Shortly before I launched my anti-bullying campaign on my website in 2011, I met a man named Kevin Jacobsen, a New Yorker whose 14-year-old son, Kameron, had taken his own life as a result of bullying. I was saddened by Kameron’s story and inspired by my friendship with Kevin, an extraordinary man who had suffered every parent’s most deadly fear — the loss of a child. And yet he rechanneled that grief into something positive: a personal crusade to prevent another mom or dad from experiencing the same crushing blow. Kevin became a tireless advocate, working with both parents to legislators, to keep other children safe from bullying. Then came the horrible news: one year after we first met — close to the anniversary of his son’s suicide — Kevin took his own life. I wept — and continue to weep — for Kevin and his surviving family. However, out of this tragic ordeal has come a ray of hope: a renewed conviction that we will put a stop to bullying. Protecting kids from harm is nothing new. We make sure they’re safe when they play sports, right? We buy them helmets and knee pads and make sure they eat enough before a big game and that they drink plenty of water. So why should our safeguards against bullying be any different? If you’re a parent coach, or school administrator who wants to build a safe environment for children, it’s up to you to be proactive in talking about bullying, letting kids know what to do when they see it in action. 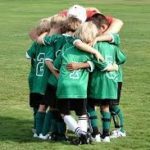 According to this article in Kids’ Sports Psychology, many kids drop out of sports due to bullying. Bullying in sports can be anything from verbal teasing to more extreme forms of hazing. In either case, it can make the sports field a hostile environment for children. Many believe that bullying only involves two people — the bully and the bullied. However, many children fall into a third, often overlooked category: the bystander. It’s the bystander who can play the biggest role in breaking the cycle of bullying. Tell a trusted adult, like a family member, teacher or coach. An adult can help stop bullying by intervening while it’s in progress, or by giving the bullied person a shoulder to lean on. Help the person being bullied get away from the situation. There are a few simple, safe ways children can help stop a bullying episode before it escalates, such as leading the bullied child to a place of safety. The most important rule: stay out of harm’s way. Be a friend to the person being bullied. Children can help someone who’s been bullied by exercising kindness and empathy. Being friendly can go a long way toward letting a child know that she or he is not alone. Set a good example: Do not bully others. If a child knows not to bully, other students will follow that example. To help even more, children can actively participate in anti-bullying activities and projects in their schools and neighborhoods. Don’t give bullying an audience. If your child witnesses a bully in action, that behavior should not be encouraged. Instead of laughing or supporting the bully, children can let the bully know that his or her behavior isn’t entertaining, nor appropriate. Together with the Free to Be Foundation I’m proud to be working on a national campaign called “Be More Than a Bystander” with the Ad Council, AOL, Facebook, the U.S. Department of Education, the Waitt Institute for Violence Prevention, Johnson & Johnson and the BULLY Project. You don’t have to face bullying alone. I encourage you to join our national conversation at the stopbullying.gov Facebook page. Together, we can spread the message that every child can become more than just a bystander — both on and off the field. We can put an end to bullying. —Visit stopbullying.gov/respond/be-more-than-a-bystander for more information on how to stop bullying. —Visit sports.glsen.org/resources, the Gay, Lesbian and Straight Education Network, which offers more specific resources for parents, coaches and school personnel to stop bullying. Marlo Thomas is an award-winning actress, author and activist whose body of work continues to impact American entertainment and culture. She has been honored with four Emmy Awards, the Peabody, a Golden Globe, a Grammy, and has been inducted into the Broadcasting Hall of Fame. In 2010, she launched her website, MarloThomas.com, in partnership with AOL and The Huffington Post. Ms. Thomas is also the National Outreach Director for St. Jude Children’s Research Hospital in Memphis, which was founded by her father, Danny Thomas, in 1962. In 2004, she co-created the hospital’s annual Thanks and Giving campaign, a national fundraising effort that encourages shoppers to “Give thanks for the healthy children in your life and give to those who are not.” Ms. Thomas lives in New York with her husband, Phil Donahue. Who Are The Role Models In Women’s Team Sports?